This is Bill Granger’s take on a traditional Vietnamese caramel dish. Heat the oil in a large frying pan over a high heat. Add the salmon in 2 batches and cook each batch for a couple of minutes until lightly browned. Turn over and cook the other side for 1 minute, then remove from the pan. Reduce the heat to medium and add a little extra oil to the pan, if needed. Add the onion and garlic and cook for 3 minutes, stirring occasionally. Stir in the soy sauce, sugar and fish sauce. 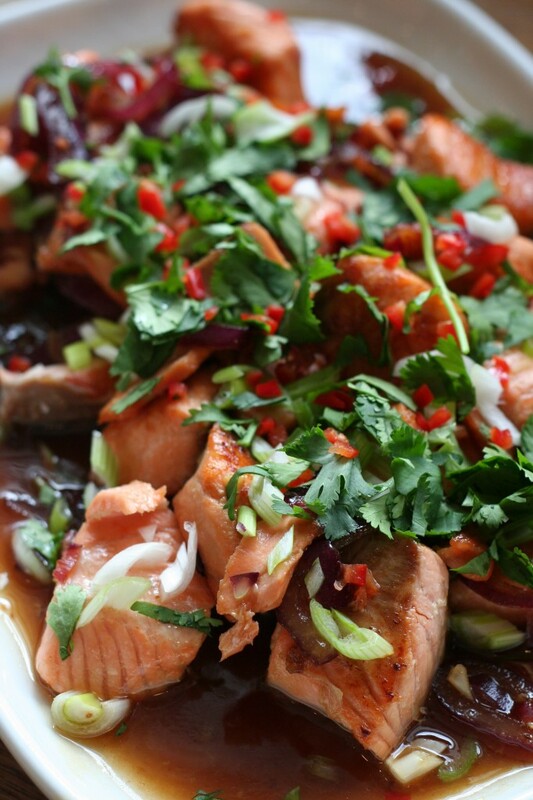 Return the salmon to the pan and cook for 1 minute, or until the sauce is rich, dark and syrupy. Sprinkle liberally with black pepper and stir through the lime juice. Serve on top of steamed rice with a little sauce drizzled over. Sprinkle over some chopped cilantro, scallions and red chili and place lime wedges on the side. If you like this salad, you might also like to try Bill Granger’s sugar snap and bok choy salad, which is very similar to this one. Put the cucumber and snow peas in a large bowl. Whisk together the lime juice, sugar and oil until the sugar dissolves (or shake to combine in a screw‐top jar). Pour over the cucumber and snow peas and toss well. Serve immediately.